A couple of days ago, I received a lovely package in the mail. I'd won a give away of a book from Denise, and it arrived in the mail on Monday. I started reading it Monday night, and finished it last night. I'm always on the look out for new authors to read, and this is one that I am definitely going to be reading more of. Along with the book, was a really sweet card. It's a teacup, and it had a real tea bag tucked into the cup. So cute. I'm drinking it right now, by the way. I've been working all afternoon, and most of the evening getting Avery's Truck quilt done. Here's a sneak peak. I'm using a pantograph from Digiteck designs called Hotwheels, by Dave Hudson. I got it all done, and started taking it off the machine. When I looked at the back, everything was fine, except for two passes of the pattern. For some very strange reason, the tension on those 2 passes was completely off, with the top thread pulled onto the back. So, there has been some ripping going on, and then it will have to be pinned back to the frame, and those 2 passes re-done. It's about 2/3rds ripped out, now. The one and only bonus of the tension being that badly messed up is that it is really easy to take out. And here I thought it would be done tonight, and I could have maybe even gotten the binding started. Oh well, that's what I get for not checking the back more often. (sigh) I'll finish ripping it out tomorrow, before going in to work, and get it finished up either tomorrow, or Friday. There's nothing new on my wall this week. Nathan's quilt is still there. It has more rows sewn together, but that's about it. I'm hoping to get the rest of it sewn together in the next few days. And then I need to get to work on getting a backing made for this one and then work on getting the 4 boys' quilts quilted and bound. 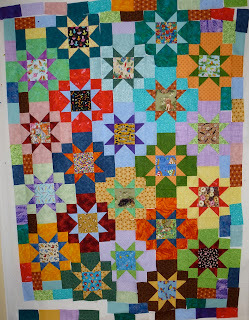 I'm linking up to Judy's Patchwork Times for her Design Wall Monday link up. Lots of fabric used this past week. Between sewing up the backing for one quilt, and the yardage used for making another. Balance: 37.5 more yards in than out. I have been maintaining my no purchasing policy, based on the fact that if I order it, I'll have to move it come January, which is a shame, because there have been all kinds of sales lately. But then, this morning, I got this brilliant idea that I could order fabric, and just have it shipped to the new address. That way I don't have to move it, because it will already be there. Something to think about..... LOL!! I'm linking up to Judy's Patchwork Times Sunday stash report. I spent last evening, and about an hour this afternoon, working on the Grandmother's Choice block of the week. I did today's, and the ones for the past 2 weeks, as well. I'm still one block short. The Little Red Schoolhouse. I paper pieced this one, since I really didn't want to be bothered with all the odd shaped templates. Little Boy's Breeches. This one was a real challenge, and it took a bit of thought before deciding to paper piece this one, as well. It worked fairly well, except there was an oops where the blue pants fabric didn't come down far enough to be covered by the center square. So, I covered the oops with the red square, and then put the brown square on top of that, and appliqued them both down. Now it looks like the pants have a yoke. I didn't do the inset corner squares, either. Today's square, Everybody's Favourite, was very easy and fast to do, compared to the last two. My productive streak, started at the quilt til you wilt day on Saturday, has continued. I have 3 of Charlene's baby quilts finished. Here's a sneak peak on one of them. The quilt itself is a collection of pastel dotted fabrics, in a turning twenty variation. But the quilting inspiration came from the border fabric. I had this owl design originally for a border treatment. I enlarged it, and laid it out as a pantograph. So very cute. And I've gotten a lot more done on Nate's quilt, as well. The blocks are all done, and it is now in the process of being sewn together. Two rows are done, with 3 more to go. 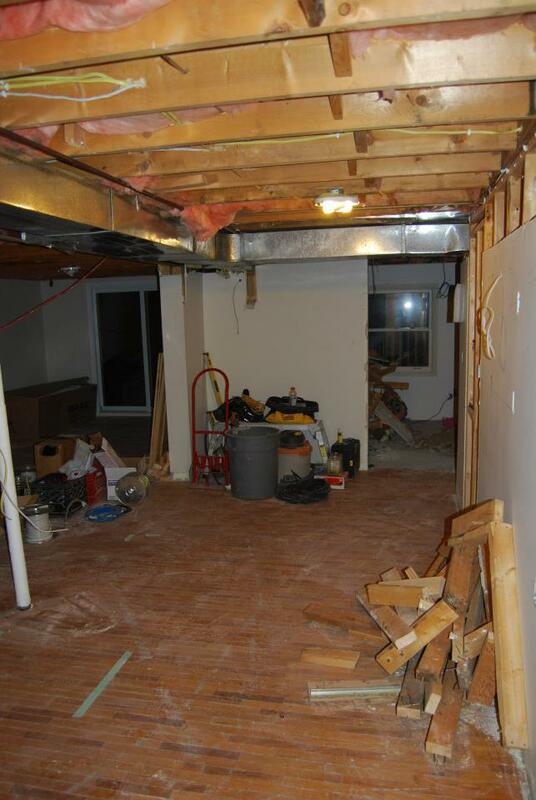 And in other news, the construction, or maybe I should say deconstruction, for our new apartment has begun. 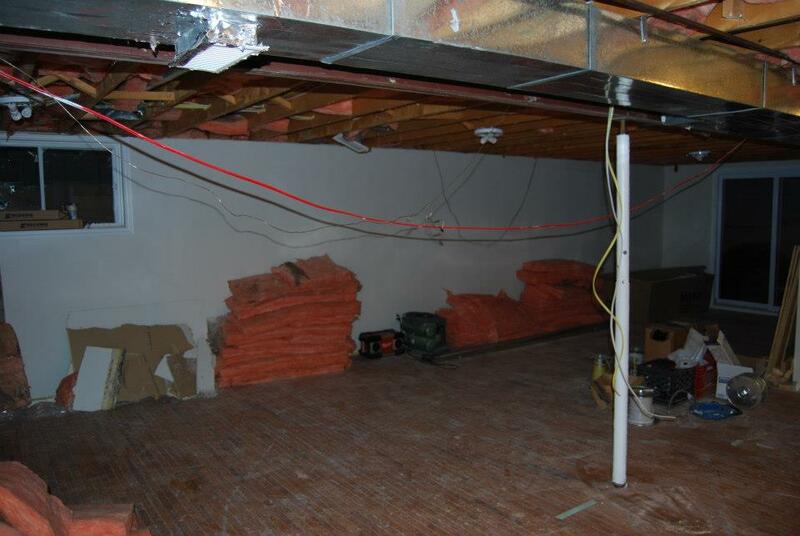 This lovely clean area of the basement has turned into this. My head knows that it will all be wonderful when it is done, but hokey smokes, it is really hard to picture it at this point. And poor Matt, who works permanent nights, has been having to come over to our place, in order to get any sleep at all. Between large drills going in order to drill holes for new wiring, and jack hammers going on order to put in new plumbing, there was no way he would get any sleep over there at all. The good news is that, from what we've seen and heard so far, the contractors and the people they use are really good. The supplies we've seen coming in a high quality. The people are friendly, and willing to answer all the questions we have had. 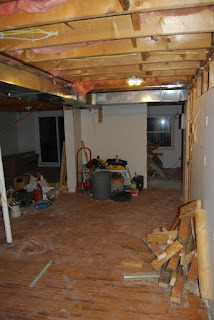 It is going to be interesting to look back at all this in a couple of months and marvel at how a lovely living space emerged from so much mess. I have lots to show today. Some of it from the Quilt til you wilt day on Saturday, and more from what I managed to get done yesterday. The first thing I did on Saturday was finish sewing Jack's quilt together. This quilt is just so much fun. 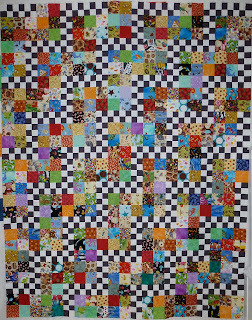 It is another pattern by Judy Martin, from her book Scraps and the pattern is called "Celebration" It was supposed to have some borders put on of the checkerboard and a single row of the 3 inch novelty squares, but I decided that I like it just as it is. Here's a close up of some of the really fun fabrics. After finishing putting Jack's quilt together, I got a start on Nathan's. It too is a Judy Martin pattern, from her book Patchwork Among Friends. The pattern is called Friends Forever. I've changed it out a fair bit. The pattern showed the center of the stars being the same fabric as the points, and it is lovely that way. But I wanted to be able to make it more kid friendly, so I used some 6 inch charms of novelty fabrics that I had. That also then involved changing up the sizes of all the pieces, but that's OK, too. There are 7 more blocks to make yet. I have them cut out, and just need to sew them together. The remaining colours will break up all those darks that are currently all together at the bottom. All the empty spaces around the edge will get filled in with more 6 x 3.25 inch rectangles, leftovers from cutting the rest of the quilt. Here's the rest of the colours waiting to be sewn up. There will definitely be some rearranging of the layout once they are all done and up and the wall. 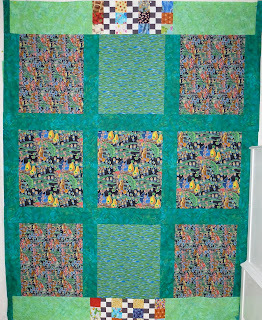 And finally, I spent most of yesterday putting together a backing for Jack's quilt. I have all kind of fat quarters of those fish themed fabrics. I've never been quite sure what to do with them as they are way to cute and fun to cut up. So I've decided to use them in backings. And I threw in the pieces that I'd originally made for one of the borders that I decided not to put on. All in all, a very productive weekend. I'm linking up to Judy's Patchwork Times where there are lots of other fun walls to look at and get inspired by. We had a quilt 'til you wilt day yesterday, sponsored by the London Friendship Quilters' Guild. It started at 9 am, although I didn't get there until about 9:45 or so. And it went until 9 o'clock at night. A couple of the guild ladies looked after getting supplies for lunch and supper, and putting the food out, and cleaning up afterwards. What a treat! They did such a fabulous job so that the rest of us could just kick back and enjoy a day with nothing to do except for eat and sew, not necessarily in that order. I think I'm a convert. I have been a solitary quilter for years, mostly due to shyness, and insecurity about being in groups. Well, no longer. I had a fabulous time, and will definitely doing it again. In the morning. I worked on getting the center part of Jack's Celebration quilt all sewn together. I have the border blocks to do, and it will be done. That is on today's to do list. Then, in the afternoon, I got a start on Nathan's quilt, and I now have 15 out of 22 blocks done. It was so much fun to have collaboration on which colours to pick, and to be able to talk and laugh while working on quilts. I'll have pictures by tomorrow. Balance: 44 yards more in than out. My goal for the rest of the year is to work from stash on hand as much as possible. 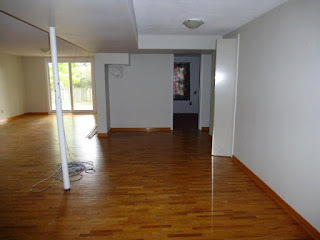 The renovations to our new place start tomorrow, and are projected to last 4 weeks. I have no desire to move over the Christmas holidays, so we'll probably be moving during January sometime. It makes no sense to me to be buying fabric, only to have to pack and move it. Packing what I have is going to be challenging enough, although compared to some I've seen, my stash of yardage is rather small. The boxes and drawers of scraps and strips..... well that's another story entirely. LOL!! If you are interested in other stash reports, I'm linking up to Judy's Patchwork Times. I'm working this afternoon. It's always a busy day at work, on Remembrance Day. For the Veterans that I work with, this is their day. It is actually bigger for them than any of the other special days of the year. All of them are up and out of bed today, dressed in their legion uniforms- with shirts, ties, and jackets or sweaters. Some of them wear their berets on their heads. Some of them have their medals. A small number of them from our unit go downtown to the cenotaph for the services there, but most of them are too frail to go out. So the honours come to them. We gather them into one of the larger lounges and they watch the local service on TV. Some of them sing along to the old songs, some of them weep while watching the service and hearing the music, as the memories return. Then they are honoured with an afternoon tea/lunch of cake and other goodies. I think I can honestly say that this is the first time in all the years that I have been working with them, that I have looked at it other than a day with a whole lot of extra work and hassle. But we were talking about it at work last night, and one of the ladies I was working with was talking about it from this perspective - of honouring them as Veterans. And it hit me like a brick on the side of the head that she was right. It isn't about the extra work, or the shortage of staff. Not today. Today we honour them for the fight they fought for us, and the horrors they endured, and the strength they had to survive. I am blessed to be able to serve them, and I pray that God will continue to give me the strength and patience and love needed to do His service to them, not only today, but for the rest of my days working for them. I've been doing some hand stitching, but It's been on Laurie's stocking, so I can't show a picture of it. I've also been using stash, working on Jack's Celebrations quilt. Balance: 47.8 more yards in than out. I have 3 finishes this week, which actually sounds better than it really is. I did indeed get Becca's cold, (thanks for sharing that, sweetie), and it has knocked me off my feet for the past 4 days. 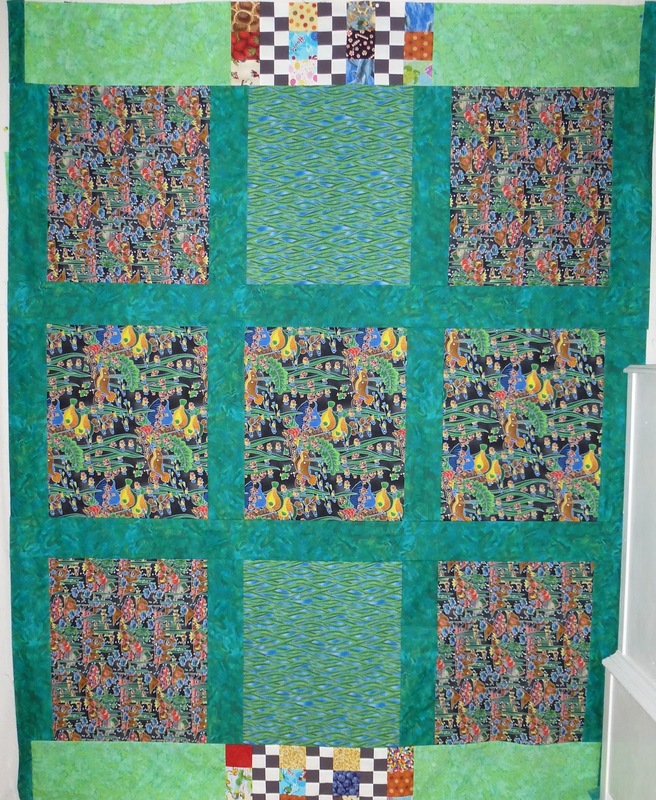 However, while surfing around blogland yesterday, I came upon this post from Bonnie Hunter at Quiltville, giving information about a quilt drive for survivors of hurricane Sandy. I have had 3 quilts sitting on a shelf in the cupboard for the last 2 or 3 years almost finished. Two of them had the binding sewn on, but needed the binding turned and sewn to the other side. The third needed to have the binding completely put on. The first one is a Bonnie Hunter pattern called Bricks and Stepping Stones. The second is a half hexagon. The third is a Kansas Troubles or Delectable Mountains, variation. I'm going to get labels put on them, and then hopefully have time to get them shipped off, if not today, then Monday. I'm linking up to Amandajean's Finish it up Friday . 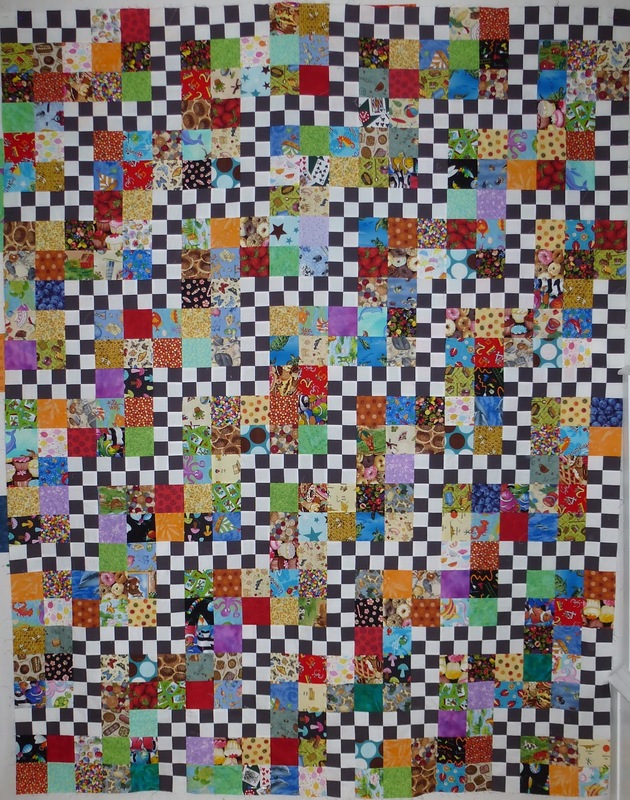 This is the beginnings of another quilt by Judy Martin, called Celebrations. I actually showed this exact same picture last week, and there hasn't been any change to it. I have lots more of the three-sies of novelty fabrics sewn, since I've been using them as leaders and enders. But I'm not sure how much more sewing there will be done in the next little while. My lovely, generous daughter may have shared her head cold with me. My head had been filling up all day, and I'm starting to get chills. Wasn't that wonderful of her..... NOT! I was supposed to be going back to work tomorrow after being off sick for the last 2 weeks, but if this keeps up, that won't be happening. Ah well, this too shall pass. I'm linking up to Judy's Patchwork Times and her design wall Monday listing. I think maybe I'll cuddle under a quilt with a cup of tea, and look at all the fun stuff. I finished another Promises and Borders block. That makes 3 out of 10 done. All it needs is the textile medium added to the coloured areas to make them colour fast. I'm enjoying the added dimension the colouring adds to the stitchery. And there has been stash used, as well. I had a Quilt of Valour from the guild to do up, and it needed a backing, so that used some stash. And then I've started another quilt for one of our grandsons for Christmas, so that's used some, as well. Balance: 50.1 yards more in than out. I'm linking up to Judy's Patchwork Times stash reports and Kathy's Slow Sunday Stitching. Matt and his cousin Seth came to the house today to do some repair work today. the area under our kitchen window was open to the outdoors. That area from the door where it juts out, all the way over to the side of the house. It originally had particle board under there, that had rotted out. Consequently, it has also been open to mice. (yuck!!!). So they came today and sealed up that open area, and then got most of the front porch re-floored as well. What a relief to finally have that done. The warmth in the kitchen is noticeable already. The floor in there has been cold for years, and it is cold no longer. Woohoo!! They are such great guys, to help us this way. I had planned on sewing all day while they worked, but I ended up babysitting Seth's son Noah, instead. He is such a sweet boy. Very active, and very talkative, and his favourite word is "why". 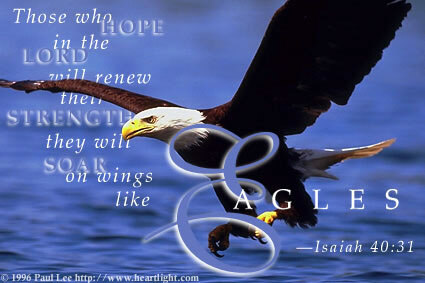 But he is obedient, listens when asked to do something, or not touch something. I had a great time with him today. It's been a long time since I had an excuse to read The Cat In The Hat. I wish I had thought to get a picture of him. Seth and Noah were here until about 5 pm, when they had to head back home, but Matt stayed later, until it got too dark to work safely. So, I did get some sewing time in. I worked on the last 2 weeks' worth of Grandmother's Choice blocks. they are done, and the sashings added to them. I'm not quite caught up with these squares. I've skipped one that was a rerun variation of one of the other squares. The square on the left that I did today was supposed to be an American flag, although I didn't have any star fabrics. But I'm thinking of substituting in a Canadian flag block, if I can find one that fits. And that's it for today. We're making progress with the new apartment plans. The financing is in place, and the contracts are signed with the contractor. We meet with all the people involved on Monday to look at the space and nail down some details. The projected start date is in 3 weeks. This is what the space looks like right now. I'm standing at the back wall when taking this picture. It's 35 feet long from where this picture is taken, down to those glass doors. There is a bedroom to the right of those doors, and also a bathroom. I'm looking forward to posting an after picture, hopefully in a couple of months. We'll probably be moving in January. I've decided that the chances are really good that, other than customer quilts and the 4 quilts for the grandsons, I won't be getting any other tops quilted. So then I decided today that I may as well pack up the ones that are waiting to be quilted. I had no idea I had this many. There are 16 of them, all bed sized quilts, waiting to be quilted. Yikes!! Guess what I'll be doing after we move? But then that means that there will be 16 more finished quilts to find space for, in a smaller space than we have now. Double yikes!! I think it might be time to do some quilt redistribution to some charities in our area.